In all of his depictions, the Emperor Diokletian looks serious and decided. 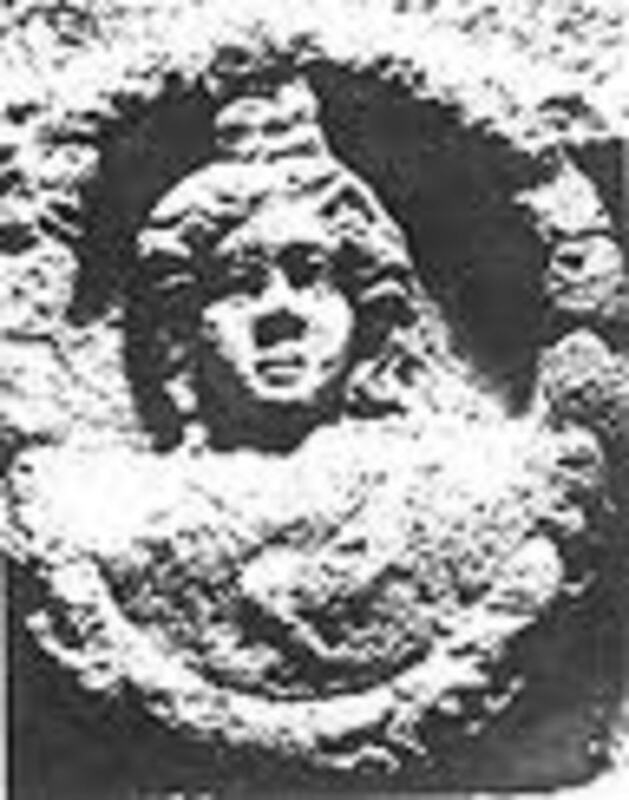 A bust of the Dioklecijan. A strong character, to be certain. This mozaik (mosaic) was found in the East. The man standing behind him may be Galeria, his "vice president" or Maksimijan, his co-ruler as August. Diokles, the humbly born Roman officer of Illiric heritage was born in the area of ancient Salona, a cosmopolitan town to the east of Split in the Mediterranean area which is now Croatia. Born on 22 December in 236 A.D. (or perhaps as late as 243-244), he ambitiously worked his way up the military ranks to an enviable position of head of Emperor Numerian's cavalry, his horseback riding division. At that time, the Roman Empire was greatly preoccupied with its ongoing wars with Persia. According to legend, the young and ambitious Diokles visited a fortune teller, who told him that he would someday become Emperor! When would this take place, he asked? "When you kill the vepar" (a wild boar). Several wild boars later, the Emperor and his sons were still alive and well. When they perished in September of 284 during the Persian War, Diokles (who was now renamed Diokletian) commented, "At last, I killed the fatal vepar". It is suspected, but not confirmed that he had a hand in their deaths. The Tetrarchy or original "Gang of Four"
On November 20, 284 A.D., Diokles - a boy from the outskirts of Split, became the new Roman Emperor. He received a new name, Gaius Aurelius Valerius Diocletianus, and a new title: The Son of Jupiter! Two Augusts in 285 A.D. 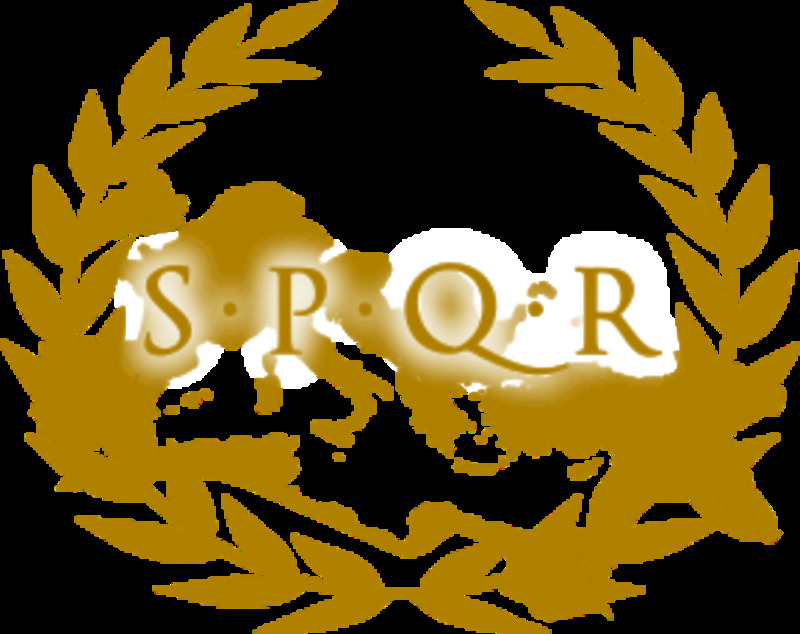 Designated to rule the entire Roman Empire on a solo basis, he is credited with asking his friend and fellow Illirian Maksimijan (Maximian) to jointly rule alongside him. The two joined forces though each could go where he pleased. It wasn't like a divorce (this is what's yours, this is what's mine) but rather like a marriage (what's mine is yours and what's yours is also mine). The Diocletian ruled the Eastern half (from a Palace in Nicomedia, in modern day Turkey) controlling Asia Minor and Africa, and Maksimijan ruled the Western half (Gaul, today's France and the heart of today's Western Europe including Brittania) based near current day Milan in Italy. Rome ceased to remain the center of the Roman Empire. The Diocletian was instrumental in creating, defining and maintaining order within the already fraying Roman Empire. Being someone who had come from the "bottom up" he saw the Empire's excesses, corruption and areas which greatly lacked control. This was the beginning of a Golden Age for the Empire, particularly in the Split area where construction of his Palace immediately began. He alone is credited with saving the Eastern Half of the Roman Empire. 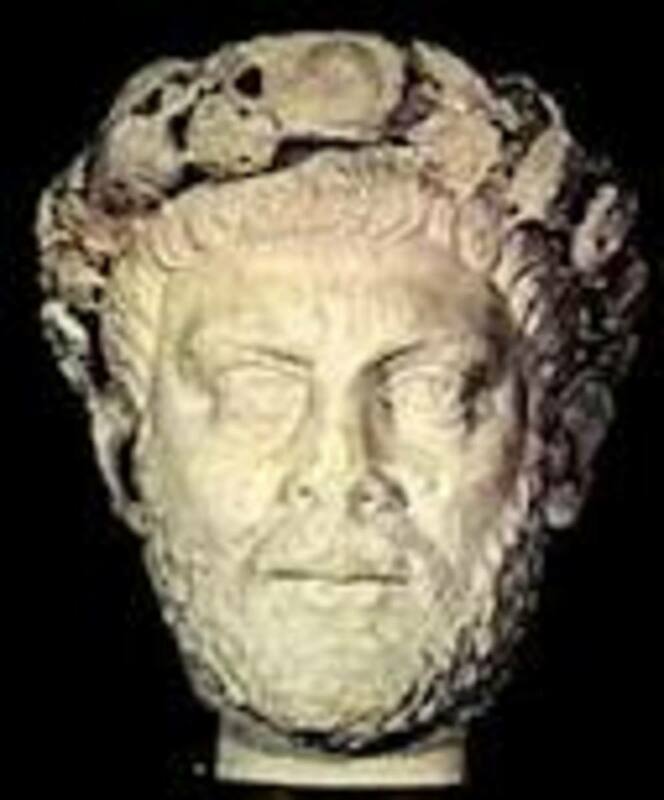 Two Ceasars in 293 A.D.
Nine years later in 293, he invited two Caesars to join his dual rule - they were Konstantin Klor, who was originally married to Saint Helena. He divorced Helena (who may have been his common law wife) in order to marry Maksimijan's stepdaughter, Teodozija. In a similar way, Galerius divorced his first wife to marry the Diocletian's own daughter Valerija (Valeria) which were probably the terms of employment in becoming joint heads of state. Saint Helena remained close to her only son, offspring of Konstantin Klor, who was also named Konstantin or Konstantin the Great (in English it's spelled Constantine). Perhaps due to her maternal influence, Konstantine I (who later became Emperor himself) was responsible for declaring the Milan Edict in 313, legalizing Christianity. 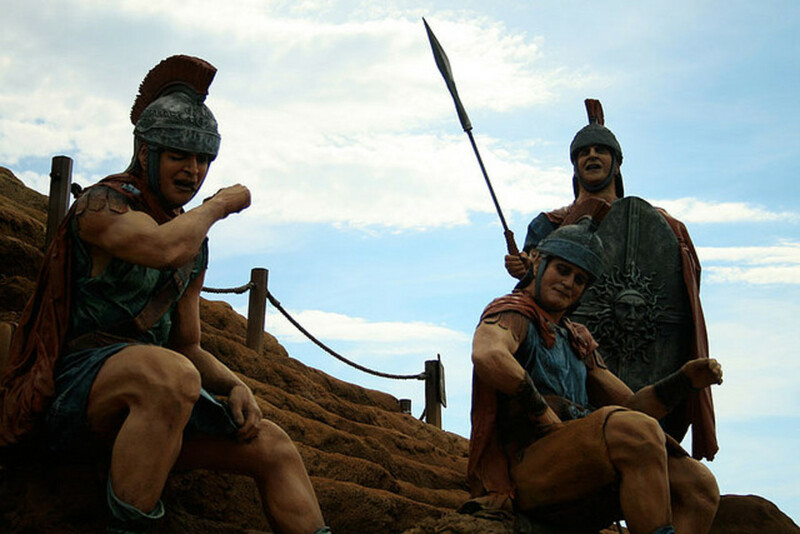 He had s struggle for power which lasted several years, but later ruled the Roman Empire single-handedly, dividing its territory between his three sons. At the Golden Door on the North Side of the Palace remain four empty pedastols which are believed to have been the foundations for four statues of the four joint rulers of the Tetrarchy. 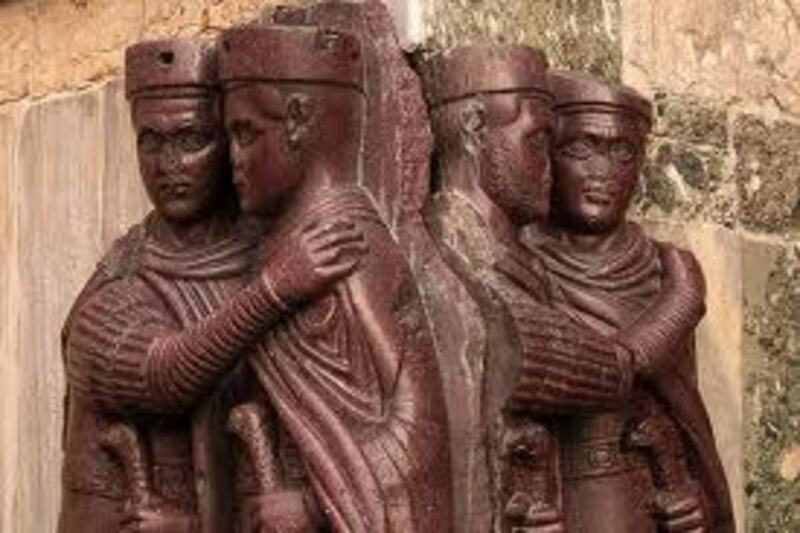 The Tetrarchy was also carved and displayed in Nikomedija (Nicomedia). It was later stolen and built into a wall on St. Mark's Square in Venice, where it can be seen to this day (see photo). 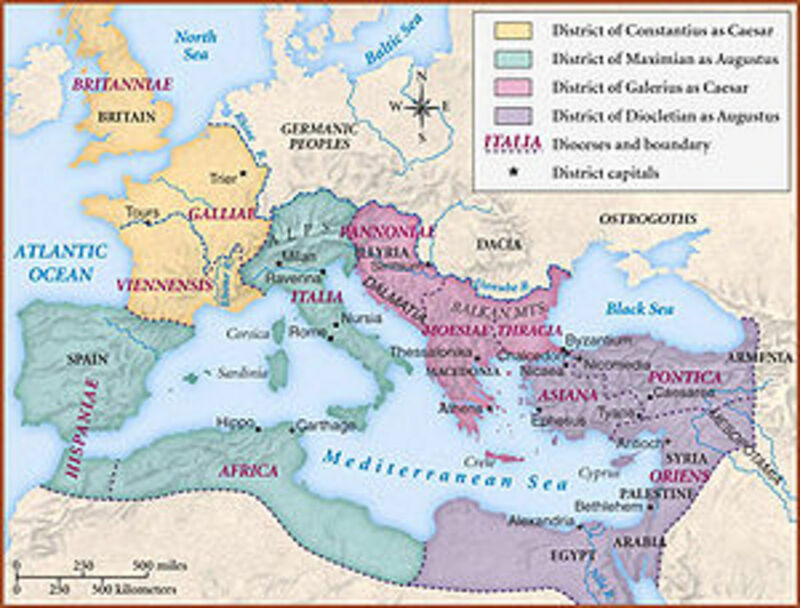 The Roman Empire circa 300 A.D.
How the Roman Empire was divided in the Days of the Diocletian. Four colors for each of the four rulers, but the Diocletian had the final word. An early fresco of Saint Helena, wife of Constantine Chlor and mother of the future Emperor Constantine, who declared the Milan Edict, legalizing Christianity in 313 A.D. 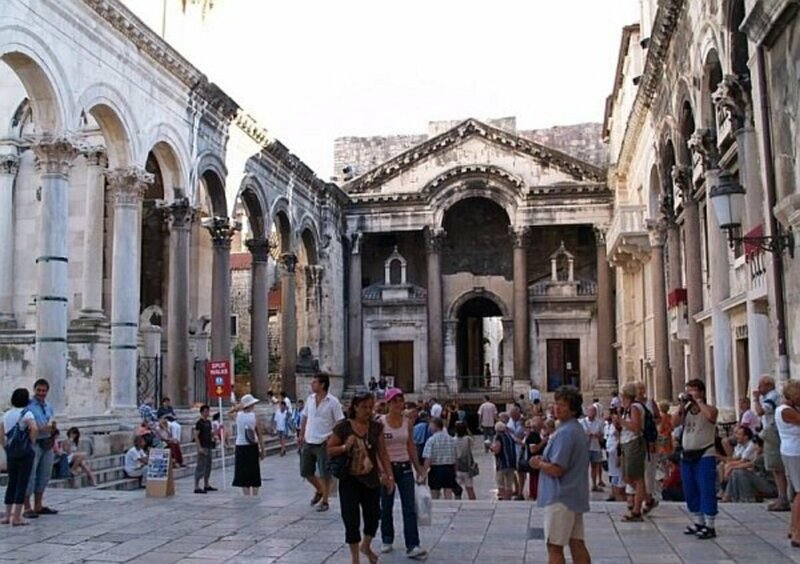 The Diocletian's Palace: Why Did he Build it Here? 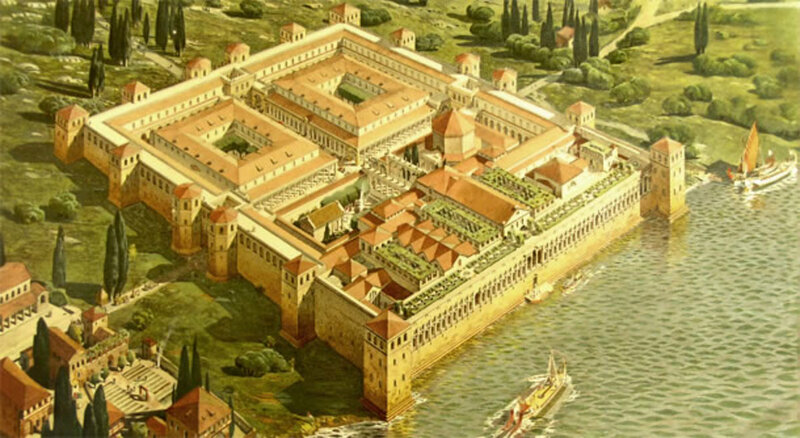 Historians speculate why the Diocletian built his palace in the Split Harbor. After all - why didn't he just live in Rome - or remain in Nikomedija from where he ruled? We know that he suffered from rheumatism, and the sulfur water was important for his aching joints. To this day, the sea is clear and fragrant from the self-purifying water and the city has a Sulfur Bath Springs (or Toplica) for sufferers of arthritis or similar ailments. He may have felt nostalgia for his homeland. When he did retire in 305 A.D., he is known for growing his own vegetables, which is something that the people of Dalmatia do to this very day - plant a garden and faithfully attend to it after retirement. 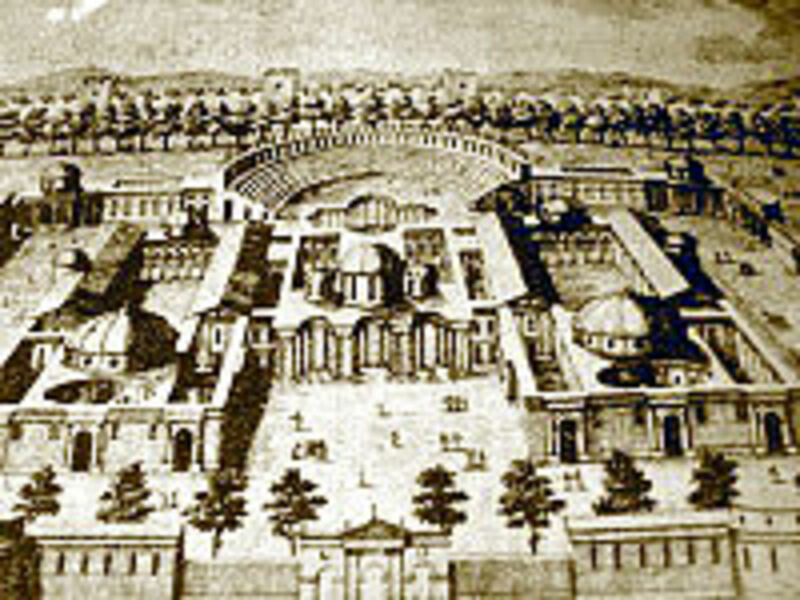 Construction of the Palace began soon after he took rule in late 284. Patterned after a Roman Vojska Logor (Military camp) it is rectangular in shape, with dimensions of 215 x 180 meters. Graced with sixteen watch towers and built on the edge of the sea, it was a strong fortress against invaders. The Palace has four distinct Gates. 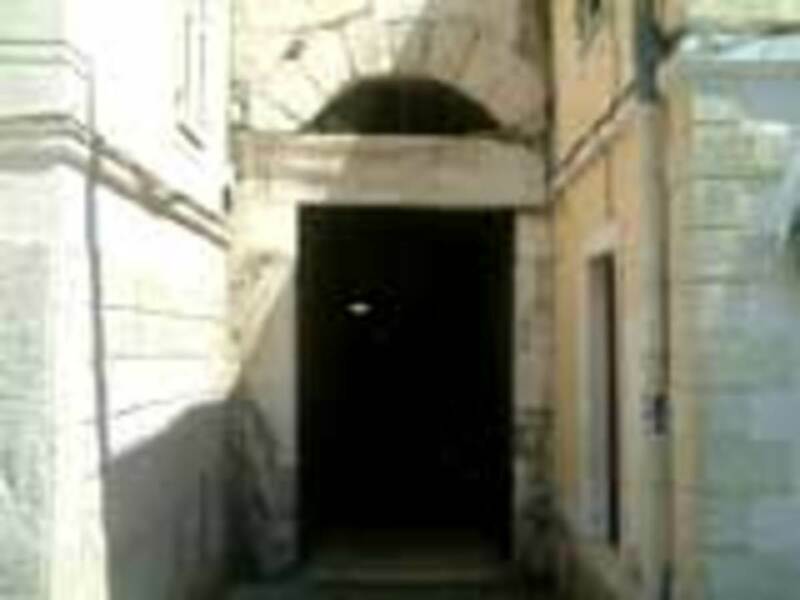 Its main and most glorious entrance is the Golden Gate, facing the North, linked by a road leading to the town of Salona, birthplace of the Diocletian. The city of Solin was a very important location, more important than Split was in the 4th century A.D. 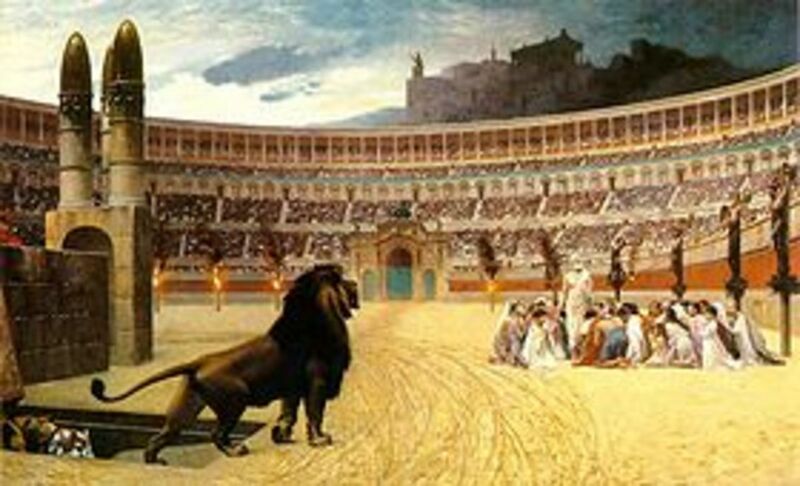 There were numerous basilicas, an Arena with lions and games of sport. It also had a theatre, several factories and a very cosmopolitan lifestyle, with natural water sources coming directly from the mountains behind today's Split. Because of the short time frame in which the Palace was expected to be completed, and the unexpected abdication of the Emperor, the Palace was built very rapidly with many unfinished details. Two pagan temples near Jupiter's Temple were never completed. The Palace itself is a UNESCO world heritage site since 1979. Almost every age's architecture - Ancient, Romanesque, Renaissance, Baroque, Gothic - can be found within its walls. Dioklecijan and Maksimijan (Augusts) with Galerija and Constantin Chlor (Caesars) as co-rulers across the massive Roman Empire. Constantine's nickname was "Pale Face". 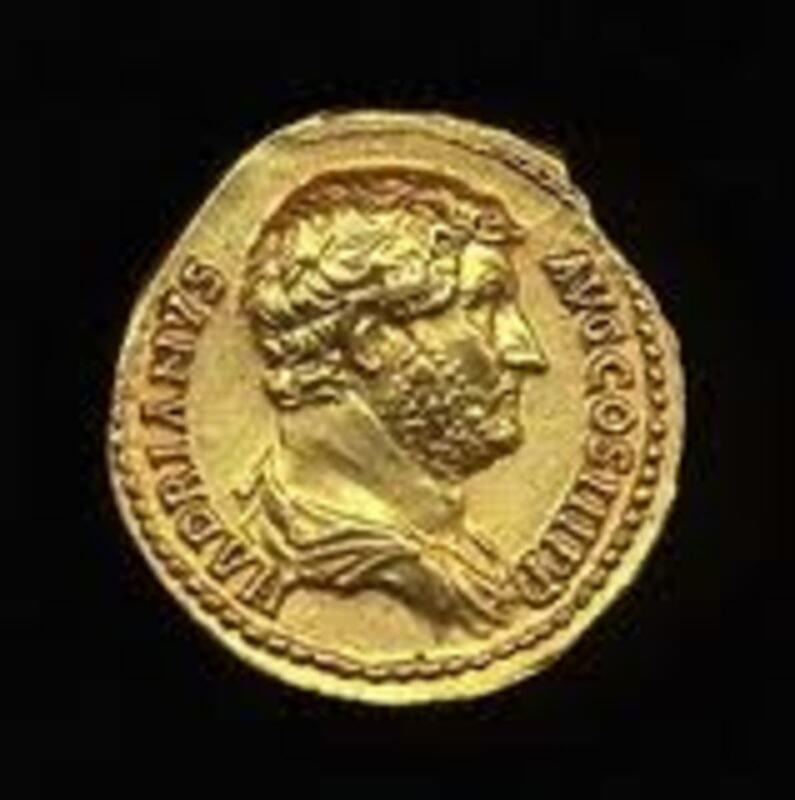 One of the few remaining portraits of the Diocletian who lived from 243 to 316 A.D. by most contemporary accounts. He built the rectangular shaped Palace as a retirement home, heavily fortified and containing separate sections for his army, a clothing factory, residential zone, ceremonial area and Mausoleum. 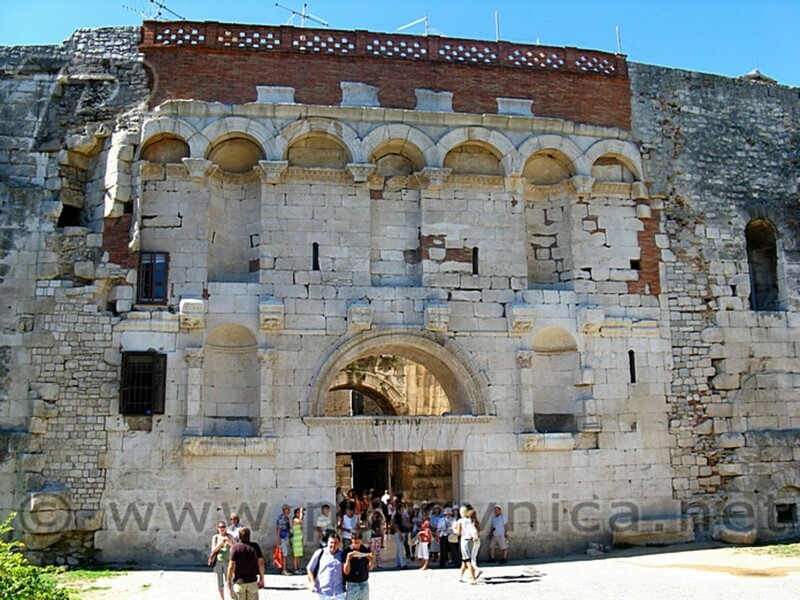 The Diocletian's Palace in Nicomedia (Nikomedija) which was located in modern-day Turkey. Some of his attributes include his frugal nature. He had a passion for building, and is credited with building the Roman Baths - which he visited only once, during his 20th anniversary celebration of being the Emperor in Rome itself. He is the builder and engineer of the Diocletian's Palace in Split (then Aspalathos) which became the basis for the City of Split. He is credited with defining the "late Ancient era" of art and architecture due to his Roman styled arches, combined with Greek columns, Egyptian sphynx's and Dalmatian rock and tile. He was very decisive, with an Illiric practicality and sensible nature. In twenty years time, he greatly reformed the system, dividing the population between military and civilian (since they had different needs), set up a fair and balanced accounting system, requisition system and organized purchasing system. He promoted social and health reforms and brought much needed order to the already crumbling Roman Empire. To the left and right of the arch above the door lie empty pedastols where the statues of the Tetrarchy are believed to have been in Ancient times. The Diocletian and Maksimian were on top, and Constantin and Galeria were on the lower level. In the year 300 A.D., Paganism (Roman Gods) was the religion of the day. Rulers were gods, or at least descended from gods, or else how could they have been chosen to rule the masses? The general population accepted this logic, that an extraordinary individual could only be chosen to rule the Roman Empire. At the center of the Palace was the Peristil, an open air court used for ceremonial functions. To this day, it is the pearl of the Palace, nearly always filled with visitors and locals. There are churches, Jupiter's Temple and two Sphynxs. It is the courtyard surrounded by imposing columns and arches where the Diocletian himself would emerge and receive homage from the people. They bowed prostrate and he would speak to them. To this day, the same area is used for summer performances at the Palace, including the traditional performance of Guiseppe Verdi's Aida every summer during the Split Festival. To the left is the Cathedral - to the right is the Temple of Jupiter. Through the center back wall is the entrance to the Diocletian's chambers. There are several rose colored columns for the glory of the Emperor. A stone carved portrait of the Diocletian's daughter and only child, Valerija. The portrait shows her strong character and beauty. 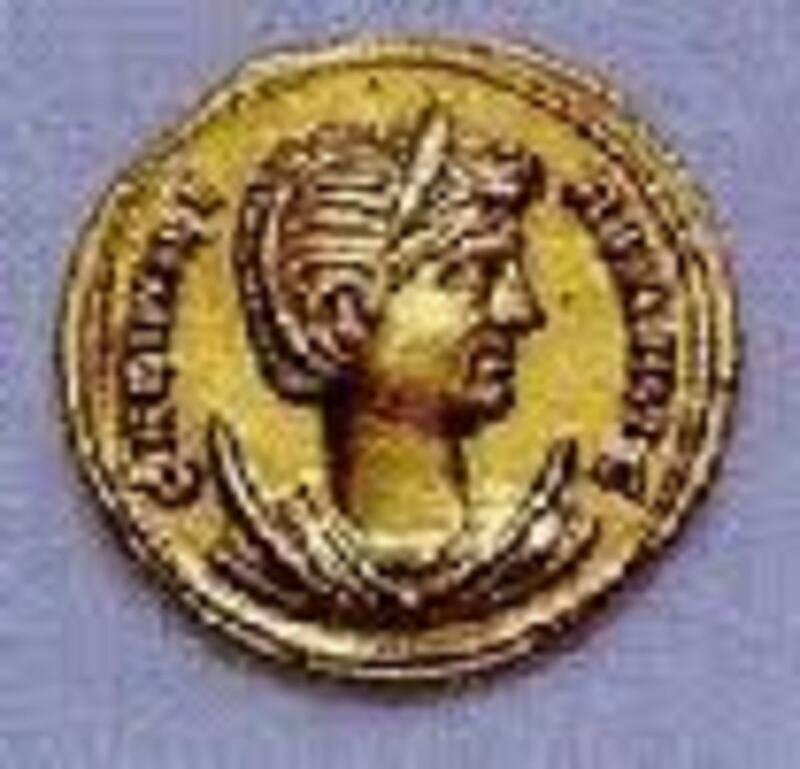 The Diocletian's wife and true love, Prisca as depicted on a golden coin. There are many legends of the two women in the Diocletian's life, who he obviously loved very much. To this day there is a stone carved portrait of wife Prisca in the Cathedral (his former Mausoleum). Together, they had one child, a daughter: Valerija (Valeria).It is probable that both wife and daughter of the Diocletian were in fact, "closet Christians". The state arranged marriage of Valerija and Galerija was probably a farce intended to create solidarity between the Tetrarchy. It is even thought that Valerija fell in love with Saint George, an Christian martyr killed during 303-311 when the Four Edicts were in force. He is (most unfortunately) best known for persecuting Christians. In those days, since Christians were monotheistic, they were automatically guilty of treason, since the Roman Empire like many (if not all ancient empires) were polytheistic. After all - they placed a god on the throne. 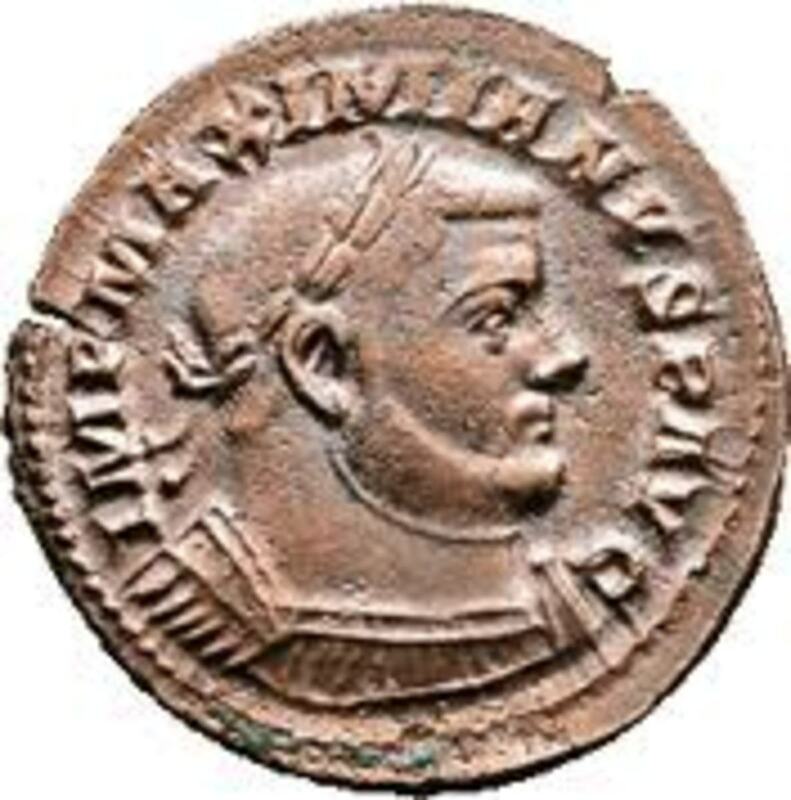 The Diocletian was in fact very tolerant towards the religion when he took rule in 284. We don't know if he received pressure to take action against these "rebel rousers" as he later called them, or if he in fact changed his mind over time. 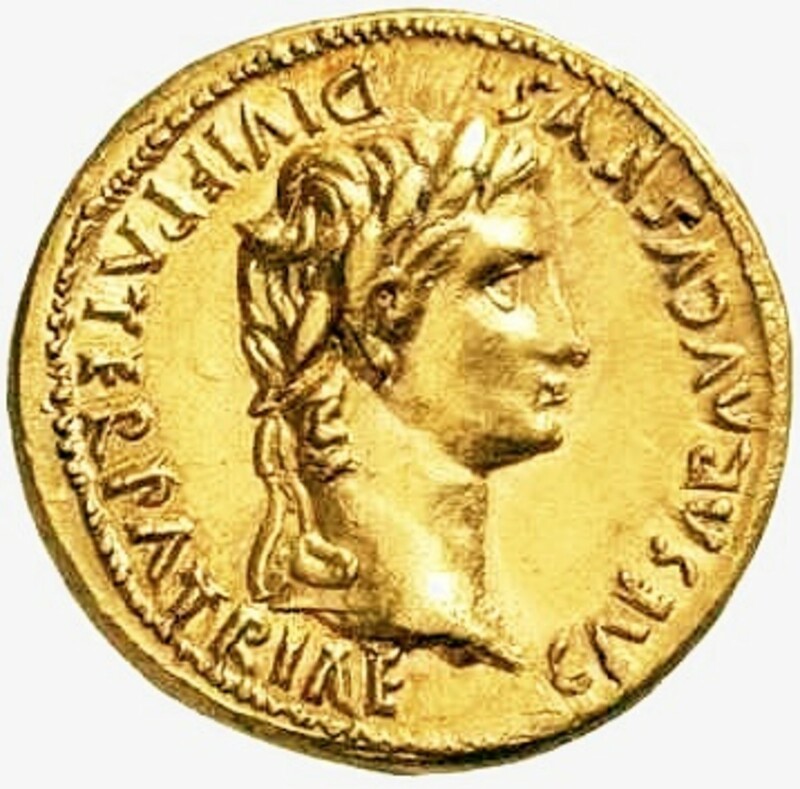 History shows that the Caesar Galerija was the most intolerant towards Christianity, and was the major reason that the first of the infamous Four Edicts were passed in late February 303. This resulted in many deaths, including Saint Dominus (known as Sveti Duje or Sveti Dujam in Croatian), the Patron Saint of Split who was beheaded in the Ampitheatre at Solin in 304. A depiction of his death is shown carved in stone at the Altar of Sveti Duje in the Split Cathedral. It was at this site that Pope John Paul II knelt and prayed when he visited Croatia. 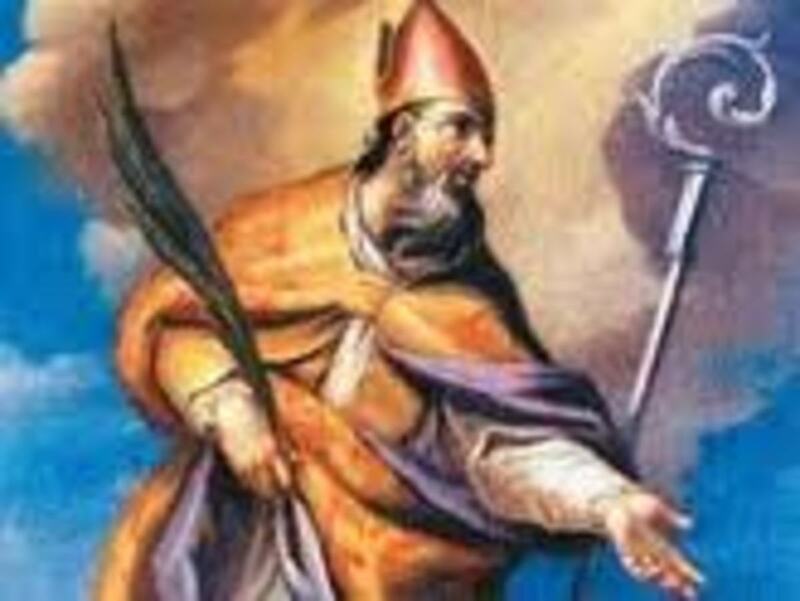 The co-Patron Saint of Split, Anastazija (a male) was thrown into the sea with a miller's stone tied around his neck. Just about every saint from this era died a terrible death, and the Diocletian, being Emperor, was largely responsible for this trend. From what historians know, the crypts under today's churches in the Palace were used to torture Christians. Some of them have become churches or chapels in their own right. The Palace is filled with history - good, bad and unpleasant. Additional saints that died during this time was Saint Anastasia from Zadar (a female) who was married to a Roman officer. 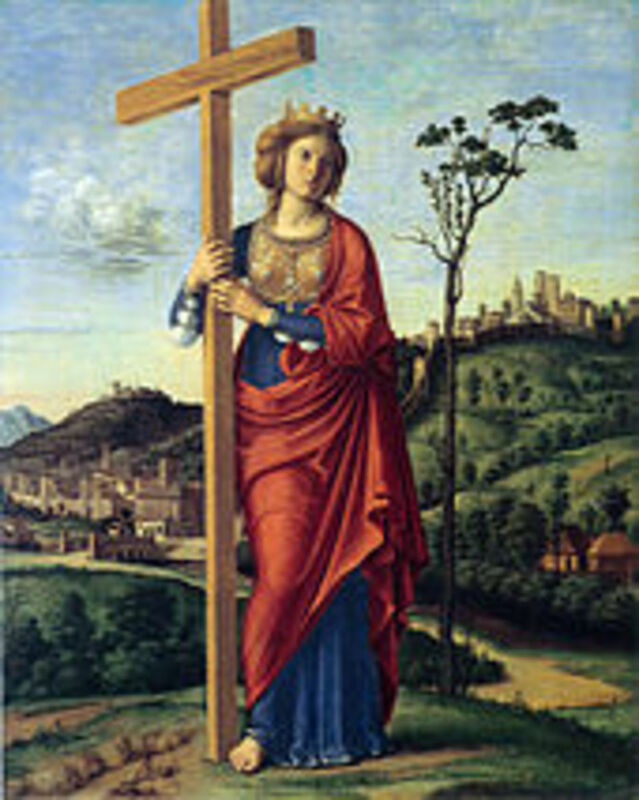 She had been subjected to house arrest by her husband (since she was breaking the law) then eventually sent to Rome where she was burned at the stake on Christmas in the year 304. Saint Lucy (Sveta Lucija) from Siracuse, Italy was also tortured and killed, her eyes removed. Saint George (Sv. 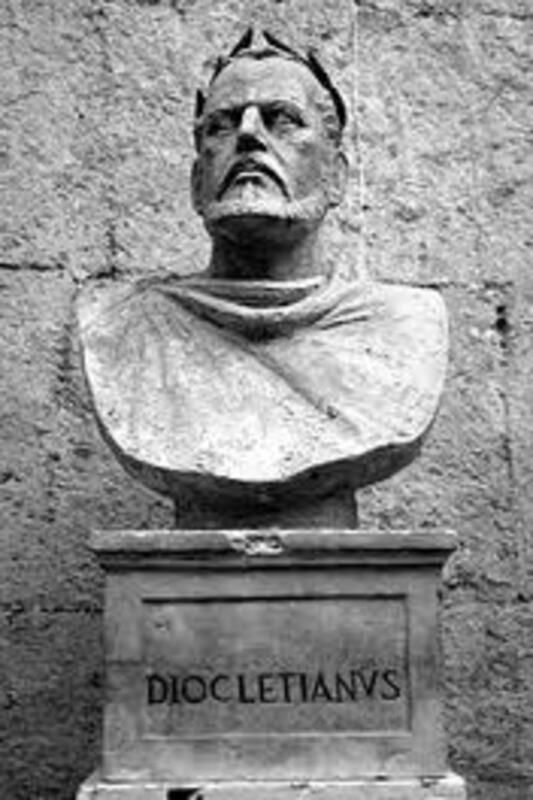 Jure) who is famed for "killing the dragon" (an acronym for 'destroying evil') was also tortured and killed during the Diocletian's reign. Only a short time later, the Diocletian unexpectedly abdicated his throne on May 1, 305. No one knows exactly why, but the author of this Hub believes he had probably had enough of the entire mess. 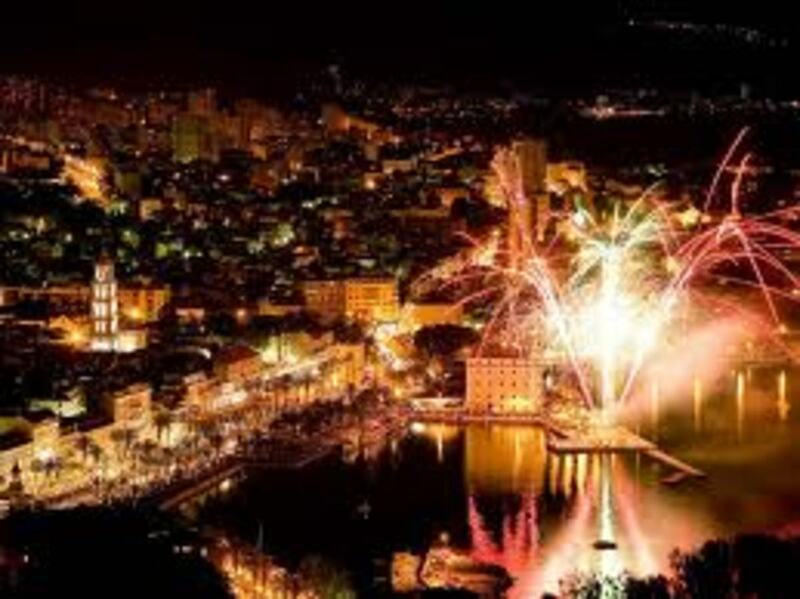 On May 7th every year, the City of Split celebrates its Patron Saint's special day. A view of the city from Marijan Hill. Sveti Duje, Patron Saint of Split, martyr - probably the first Archbishop of Salona. He was originally from Syria but made Dalmatia his home. He died perhaps on 3 December 316. How he died is not clear. He either died by his own hand (suicide) by drinking poison, or may have been poisoned. In those days, no autopsy was done. The general consensus is that he died of old age within the walls of his Palace. As an Emperor, he stands alone in the history of Rome for many reasons. First, he was the one and only Emperor to step down on his own volition. He was not murdered on the throne, as usually was the case. In 306 he attended a meeting near modern day Vienna, where he was invited to return to his former position of Emperor. To this, he made the surprising answer "If only you could see the vegetables that I grow around the Palace with my own hands, you would never provide me with these tempting offers." He was particularly proud of his cabbages. In other words - thanks, but no thanks. 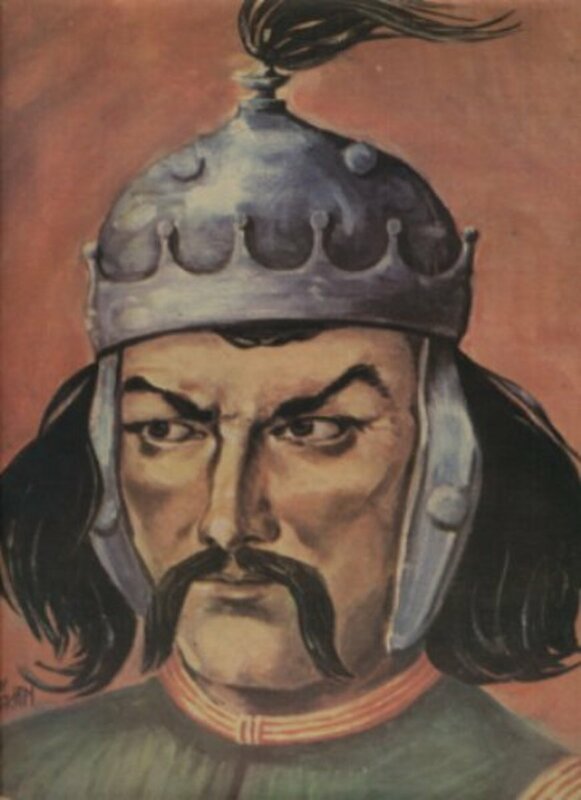 Constantin the Great, who took rule in 306 but gained full power and glory in 320 A.D. He is known for legalizing Christianity and building the city of Constantinople. The Diocletian experienced something called damnatio memoriae - or, "let's pretend that he never existed". Numerous statues and relics of the 20 long year reigning Emperor were destroyed. His sakofag (burial tomb carved of burgundy colored rock) was destroyed and thrown into the sea, presumably by angry Christians. Konstantin Klor died in 306 in Britannia ("of illness"), but not without great animosity towards the Diocletian. He felt great personal embarrassment towards the Diocletian for not immediately naming him as successor ruler when the Diocletian stepped down in 305. He was among the first to criticize the Diocletian as an old man who was "hiding" in his Palace upon retirement. But history cannot deny the Diocletian's greatness. 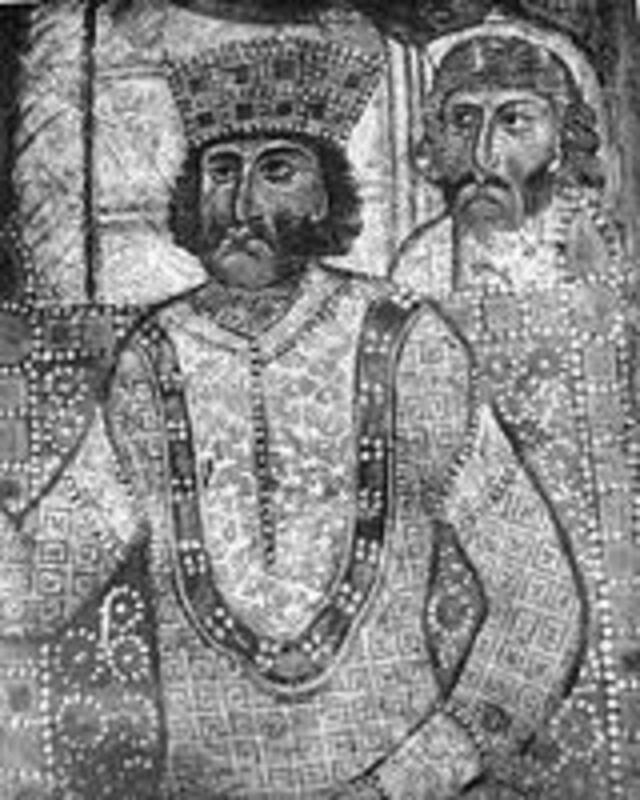 Konstantin became Roman Emperor from 306-337. 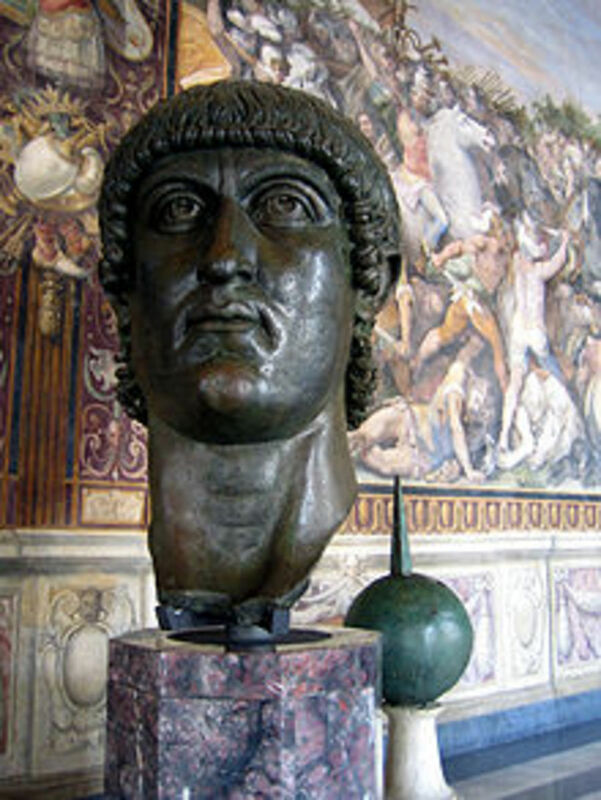 Also known as "Constantine the Great", he best known for legalizing Christianity with the Milan Edict just a few years later, in 313 A.D. After eliminating Galeria ("the Barbarian"), he ruled the entire Roman Empire alone, later dividing the job between his three sons, who all had names similar to his own. Constantin II, Constantius, and Constans. His daughters were named Constantina and Helena. He named a city Helenopolis (present day Altinova, not far from where Nicomedia once stood) after his beloved mother, Helena. She was responsible for finding the True Cross and Manger in the Holy Land. It was three hundred years since the Christ, and managed to have these relics preserved in silver so that they would not decay. No one knows if Constantine was a Christian from his youth, or gradually accepted the religion with time. When the Avars and the Slavs destroyed Salona around 615 A.D., the residents of the town took refuge on the surrounding islands, then, after receiving permission, moved into the Diocletian's Palace. In the same century, Ivan Ravnjanin moved the Archdiocese to Split instead of Salona (today's Solin). In the 7th century, pagan objects of worship were removed ("cleansed") from the Diocletian's Mausoleum and the Cathedral began to evolve. Originally named after the Assumption of Mary, it is best known as Cathedral Sveti Duje. Its altars which hold the physical remains of both saints Duje and Anastasia are among the most ornate in Europe. Craftsmen from all over Europe came to work on them, with stone carvings and oil paintings in every corner of the Cathedral. Photography is not allowed inside. There is a video (with the amazing sounds of its bells) below showing some of the church's best known cultural treasures and attributes. Pope John Paul II's himself visited the Cathedral in 1997. You could say that Sveti Duje had the last laugh. From being a place of torture and suffering, the Split Cathedral became one of the oldest and best loved Churches in all of Europe and the world. Neat hub. Being an American with an interest in history it's interesting to see how the Roman Empire is viewed outside the West. Voted up and sharing! What a fantastic hub EuroCafeAuLait, I really enjoyed learning about Diocletian and his exploits. I was recently watching a documentary on the History Channel about the first Emperor from Africa. The Roman Empire (especially in it's latter years) seemed to have no problem appointing emperors from outside it's borders and I note that Diocletian was born in Croatia. Once again an example of the Romans being very progressive. Thanks, christopheranton. To this day, the people of Split respect him. He also built a fantastic aqueduct which is still in use to this day - it was used both for drinking water and fabric processing in the clothing factory. I appreciate your comments. What a fantastic hub. I feel almost ashamed of having never heard of Diocletian and how he helped to forge the Eastern Roman Empire that lasted until the 15th century. Great work, I hope you write more hubs about this period in history. You did a really good job on this hub. Not many people give a balanced view on Diocletian. But you were very fair to him and you really brought the era to life. What an awesome and well put together hub you have here!